Not a significant source of calories from fat, saturated fat, trans fat and cholesterol. Whey Protein Concentrate obtained from a cross-flow micro-filtration process, maltodextrin, natural and artificial flavors, Carrageenan Gum, Xanthan Gum, lactase, stevia, sucralose. Protein needs vary greatly depending on your body type, gender, weight and the level of activity you maintain. Mix 1 heaping scoop of High Whey™ with 200 ml of cold water or your favorite beverage. Use a shaker bottle for better results. KEEP AWAY FROM CHILDREN. Store in a cool, dry place. Contents sold by weight, not by volume. Some settling may occur. Dietary supplement only, do not use as a sole source of nutrition. HIGH WHEY is made exclusively from carefully selected quality ingredients to ensure that you get only the best out of each and every scoop! Each scoop of HIGH WHEY contains 22 grams of protein sourced from premium, high quality cross-flow micro-filtered whey protein concentrate. This formula is also PEANUT-FREE, GLUTEN-FREE and NON-GMO (genetically modified organism). Each serving also contains 10 grams of naturally occuring Essential Amino Acids (EAAs) and 4.8 grams of BCAAs. 100% Instantized and 100% Delicious! HIGH WHEY is 100% instantized so it can be easily mixed with water, almond milk or the beverage of your choice to create the most delicious protein shake you’ll ever have! 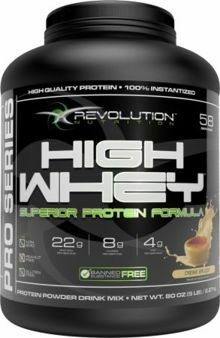 All flavors of HIGH WHEY have been carefully formulated with ingredients that do not contain gluten. Revolution Nutrition is proud to offer an alternative to people who are sensitive or intolerant to gluten.